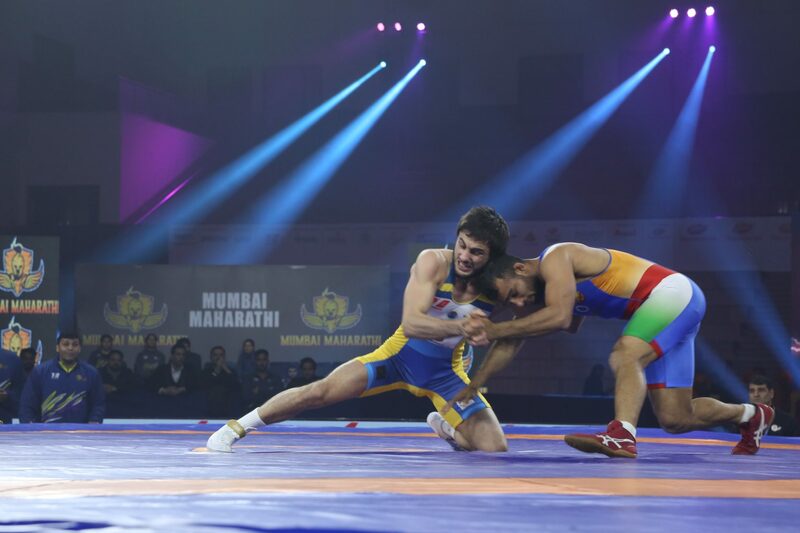 Skipper Khetik Shabalov led from the front as laggards Delhi Sultans put Mumbai Maharathi’s chances of making it to the semis in the backburner by beating them 5-2 in their final group game at the Pro Wrestling League (PWL) Season 4 currently underway at the Gautam Buddha University Indoor Stadium here on Sunday. 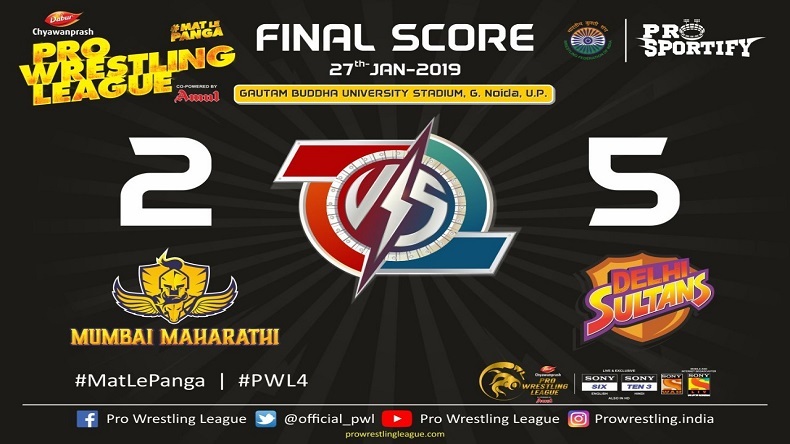 Greater Noida, January 27, 2019: Skipper Khetik Shabalov led from the front as laggards Delhi Sultans put Mumbai Maharathi’s chances of making it to the semis in the backburner by beating them 5-2 in their final group game at the Pro Wrestling League (PWL) Season 4 currently underway at the Gautam Buddha University Indoor Stadium here on Sunday. So dominating was Delhi’s performance that they clinched the tie winning the first four bouts of the evening raising an outside chance of making it to the semis whereas Mumbai’s fate now heavily waits on the outcome of the Punjab Royals and UP Dangal tie on Monday. The Russian champion Delhi Sultans icon Khetik Shabalov overcame some early aggression from Mumbai Maharathi’s Sachin Rathi to beat him 9-2 and give Delhi Sultans an early 1-0 lead. In the biggest turnaround of this season, Delhi’s European U23 champion Anastasia Shustova of Ukraine came back from a 0-5 deficit to upset Mumbai’s European Championships silver medalist Zseneth Nemeth of Hungary 10-5 in the last 30 seconds of the bout and gave Delhi a 2-0 lead. the European U23 champion Mumbai Maharathi’s Ibragim Ilyasov 11-8 in a thrilling encounter and gave Delhi a 3-0 lead after the third bout of the evening. Rio Olympics bronze medallist Sakshi Malik who came in next didn’t let go of the early advantage that Delhi got as she defeated her training partner Mumbai Maharathi’s Shilpi Yadav 16-2 and clinched the tie. Deepak Punia gave Mumbai something to cheer winning his men’s 86kg bout against Praveen Rana 18-2 on technical superiority. Asian games gold medalist Mumbai Maharathi’s Vinesh Phogat survived a scare against giant-killer Pinki of Delhi Sultans in the women’s 53kg category before prevailing 14-9 in a closely fought encounter. Andrey Kviatkovski of Ukraine put the icing on the cake for Delhi Sultans winning the last bout against Harphool 4-2 to complete the day’s proceedings. 74kgM: Khetik Shabalov (Delhi Sultans) beat Sachin Rathi (MUmbai Maharathi). 76kgF: Anastasia Shustova (Delhi Sultans) beat Zseneth Nemeth (MUmbai Maharathi). 57kgM: Pankaj Mishra (Delhi Sultans) beat Ibragim Ilyasov (Mumbai Maharathi). 62kgF: Sakshi Malik (Delhi Sultans) beat Shilpi Yadav (Mumbai Maharathi). 86kgM: Praveen (Delhi Sultans) lost to Deepak Punia (Mumbai Maharathi). 53kgF: Pinki (Delhi Sultans) lost to Vinesh Phogat (Mumbai Maharathi). 65kgM: Andrey Kviatkovski (Delhi Sultans) beat Harphool (Mumbai Maharathi).